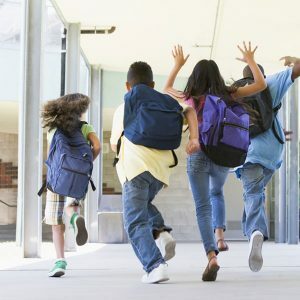 Kids of all ages (especially children in daycare or preschool) need to have changes in their summer routines that help them transition from summer to going back to school. These transitions typically need to begin in mid-July. But here we are, well into September, and school has been in session for about a month. So, what can you do if you didn’t start transitioning back in July and now your child is struggling? Try to find out if the child is bothered by any particular thing at school like using the potty, taking a nap, following certain rules, etc. Talk to your child about them and try to work out ways to help your child adjust to them. If necessary, seek help from the teacher. Make it a habit to go outside together after the school, weather permitting. Let your child run and play, ride bikes, climb on the jungle gym, go on a walk, etc. Set aside time each day to give the child your undivided attention. Even if you have only 15 minutes to spend with each of your children this way, it can make a difference. Reduce stress in the morning by laying out school clothes the night before. Give your child up in plenty of time to eat breakfast. Use a pictorial checklist to guide your child through the morning routine of getting dressed, eating breakfast, brushing teeth, getting the backpack, etc. At Learning Zone, we strive to make every child’s back-to-school experience a happy one. It’s what has made us one of the top preschools in Murfreesboro, and now with our newest location we are one of the top new preschools in Nashville. So, if you’ve been Googling “best preschool near me,” look no farther than Learning Zone. Give us a call today at our preschool location nearest you.